Since his first appearance in 1938, Superman has inspired countless similar characters ("knock-offs" would be the unkind [but true] term), from Captain Atom to Supreme to the Sentry. But the first and greatest Superman clone is undoubtedly Captain Marvel. Created a year after Superman's debut by artist C.C. Beck and writer Bill Parker, Captain Marvel was Fawcett Comics' answer to the Man of Steel. Unlike Superman, though, Captain Marvel's alter ego wasn't a mild-mannered adult like Clark Kent, but a well-behaved 12-year-old named Billy Batson who transformed into the superhero by saying the word "SHAZAM!" Drawn to a secret cavern beneath the subway, orphan newsboy Billy Batson met the immortal wizard Shazam, who granted Billy superpowers to do battle with evil. By uttering Shazam's name aloud, Billy was thus transformed into no only an adult, but the World's Mightiest Mortal; empowered with the wisdom of Solomon, the strength of Hercules, the stamina of Atlas, the power of Zeus, the courage of Achilles, and the speed of Mercury. Understandably, this adolescent power fantasy appealed to children (possibly even more than Superman), and for a time in the 1940s Captain Marvel comics outsold Superman's. 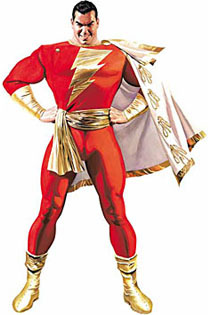 Eventually, though, Supes got his revenge when DC Comics purchased the rights to Captain Marvel and the rest of the "Marvel Family," including Mary Marvel and Captain Marvel Jr. By then, Marvel Comics had created and trademarked their own character named Captain Marvel, so all DC Captain Marvel comics and merchandise has to be sold under the name "Shazam," which has led some people to think that's the hero's name (in fact, it's the name of the wizard who gave him his powers). Since then, DC has spent quite a bit of time and effort trying to find a place for Captain Marvel within the DC Universe. However, the best efforts have either been standalone graphic novels, such as Jeff Smith's Shazam! : The Monster Society of Evil or Alex Ross's Justice. While I love the new Batman: The Brave and the Bold cartoon, a new Captain Marvel cartoon, geared toward the same age group, would be an ideal use of the character in the 21st century. After all, isn't the concept behind the immensely popular Ben 10 pretty much the same thing - a young boy turns into an adult superhero? One of my favorite bits of comic book trivia is that C.C. Beck originally modeled Captain Marvel's face on actor Fred MacMurray, best known to my generation as the dad from My Three Sons (well, those of us who grew up on Nick at Nite, anyway) and the star of The Absent-Minded Professor. Beck later used other actors as models for CM, but since Alex Ross started painting the Big Red Cheese on a regular basis, the "ripped young Fred MacMurray" look has been dominant. The Horsemen have definitely gone for the Ross look, with the sharp eyebrows, narrow eyes, short-cropped hair, and confident grin. It's not perfect, though I'd argue the imperfections were more due to the molding process than the sculpting; but I do think this head looks more like Ross's art than DC Direct's attempt, which is a bit on the hefty side. The paint work on my figure's face was decent except for the eyebrows, which were a bit thin. I touched mine up with a narrow Sharpie. Lots of other classic Captain Marvel details are here, from the stitches on the front of his boots to the knotted cords on the left side of his cape. He also has a unique chest sculpt complete with the gold-buttoned lapel. The belt is more of a sash, and is sometimes drawn with part of the belt hanging down from the side where it was tied. I rather like that look, but it's not what the Horsemen went with here - possibly to save on tooling costs. 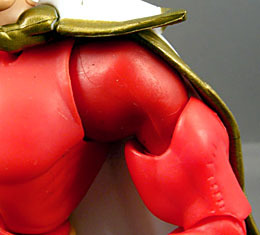 One aspect of the sculpt is the odd angularity of the shoulders. They're almost reminiscent of the shoulders in the 2002 MotU line. The Horsemen explained on their site that the angular shoulders are meant to represent the shoulder pads CM is often depicted as having. I don't find they detract much from my admiration of the figure, but they are odd. Overall, though, I think the Horsemen have successfully captured the look of the Big Red Cheese, and this may be the definitive action figure of the character - at least for now. DC Universe Classics has often struggled with characters in red outfits; for whatever reason, figures molded in red seem to end up looking rather toy-ish. There's a subtle, vaguely translucent quality to the red plastic that kills the illusion the character is wearing an outfit, rather than being made of plastic. Captain Marvel is no exception to this, but fortunately, he has a matte texture to his body that softens the plastic effect. Unfortunately, the colors aren't uniform, especially on the arms - look how bright the red of the bicep is next to the shoulder. This is the sort of problem that a very light, carefully-applied wash can even things out, but that doesn't happen here (CM does have a light wash, it's just unevenly applied). The same goes for the tips of his boots, which are molded in bright yellow. Some collectors have stated they wished CM's belt and boots were colored gold like this gauntlets, but I don't mind in this case, since this is how he's usually depicted in comics, if not in Ross's work. 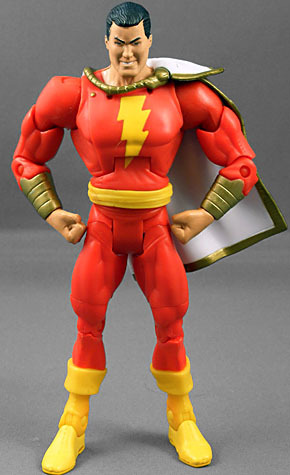 Captain Marvel has the standard DCUC articulation. Like most DCUC figures, he can look down just fine, but he has a hard time looking straight up for good flying poses. 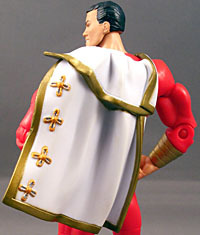 I found the left shoulder on my figure was a bit limited by the stiff cape, but honestly it doesn't bother me much. Meanwhile, the right shoulder on my figure is a little loose, but otherwise I had no issues. Other than his piece of Kalibak (the left leg, a 3¼" piece with two toes, and joints at the ankle, knee, thigh and hip), the Big Red Cheese is weaponless. Given that his evil counterpart Black Adam will be coming with his scarab necklace, some sort of pack-in with CM would have been nice - perhaps a tiny Mr. Mind figure? I'd like to like Captain Marvel more than I do. His sculpt is superb, but the mediocre paint applications and molded plastic parts hurt him a bit. Still, he's one of my favorite figures from this series, and it's great to have such a well-sculpted, well-articulated Captain Marvel at last.